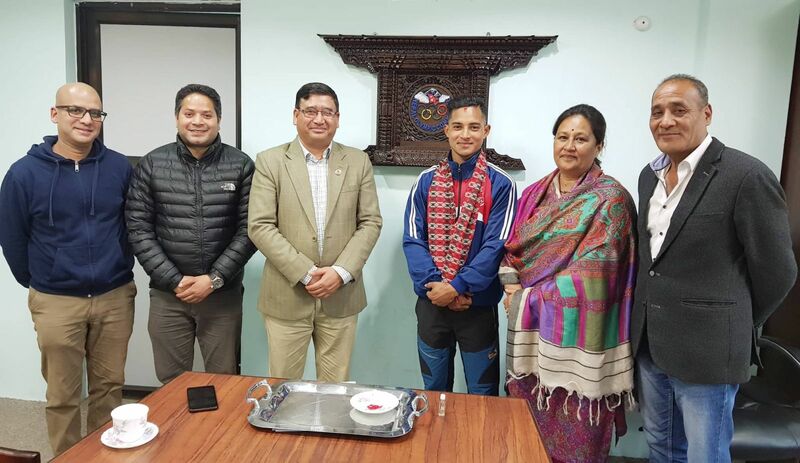 President of NOC/Member of Parliament Honorable Jeevan Ram Shrestha bade farewell to Mr. Ashish Chaudhary for the training program from Asian Athletic Academy slated at Tokyo, Japan from February 18 to March 3, 2019. According to the MOU Signing between NOC, Tamura City Mayor and Athlete’s Society of Tamura City for the preparation of 2020 Olympic slated at Japan Mr. Chaudhary(22 years), a sprinter is going to participate in a training program from Asian Athletic Academy. This is a part of the NOC’s Olympic 2020’s project. President Shrestha gave his best wishes and demanded commitment towards the sports and suggested the athlete to make the most of this golden opportunity. Mr. Dai Tamesue : The first Japanese sprinter to win a medal in a track event at a World Competition. Current Japanese record holder for Men’s 400 meter hurdle (as of January 2019). Bronze medalist of the 2001 World Championships in Edmonton and 2005 World Championships in Athletics in Helsinki. Mr. Msahiro Ohnishi : Learned Coaching in University and graduate school, Works as coach for TRAC (running school) from 2015 and supports Para-athlete and athletes in Asian countries. In the farewell program Vice President of NOC Ms. Jyoti Rana, Executive Member Mr. Nilendra Raj Shrestha and Mr. Sujan Koeral were present.